But don’t take my word for it. Some of our media partners at TruePublica have uncovered just as much democracy wrecking shenanigans going on in the background. Take openDemocracy. They put an investigations team on following the money and found a link between foreign billionaires and Brexit just as I did. They found illicit secretive sources of political funding and exposed Arron Banks, the self-proclaimed ‘Bad boy of Brexit’ and the ongoing scandal of his huge donations. They even worked with accountants to show his insurance businesses were verging on bankruptcy at the time of the referendum and yet he brought £8 million to the Leave campaign. This donation is now under investigation. Like me, they found the link with Steve Bannon, Trump, Cambridge Analytica and the now infamous Facebook data scandal. That wasn’t that hard but confirming the use of advanced social engineering systems that were used in the battlefields of Iraq and Afghanistan designed originally to ‘change hearts and minds,’ was. But sadly, that too is a fact of the farce that Brexit has become. Then there are our partners at Unearthed, the investigative arm of Greenpeace. Their undercover investigation, published in the Guardian, raised concerns about the Institute of Economic Affairs (IEA) work on Brexit that may have broken charity rules by campaigning for a specific policy outcome. It’s all about a hard Brexit and a US-UK free trade deal. The IEA is registered as an educational charity. It has been under investigation by the Charity Commission since July as a result. I go into some detail about the IEA and others and also highlight one American organisation in my book with over 450 business relationships and links to hard-right free-market think tanks, themselves linked to the hard right-wing Tea Party and other profit-driven fundamentalists. These powerful American outfits are also pushing for a hard Brexit and nothing less. Carol Cadwalladr’s epic award-winning investigations published in The Guardian and The Observer highlighted the secrets of dark money and the foreign billionaires behind Brexit. Again, she was following the money and made the connections between big business interests and Brexit. The list of scandals uncovered by Cadwalladr continues to grow. Then there’s Theresa May. She has been accused of holding secret weekly Brexit meetings with Cabinet ministers and civil servants of which no record has been made. This is unheard of outside of a wartime government. Of the clandestine gatherings, one insider told the London Evening Standard: “In terms of democracy this feels like a scandal.” It is. This government is defined by its secretiveness and a desire to avoid any scrutiny whatsoever. Theresa May and her cabinet are now avoiding parliament on anything serious. The problem is, as I have said time and time again over the years even before she became the PM – Theresa May is an authoritarian leader, not a collaborative one who believes in democracy. She has decided what is best for the country and no parliamentary participation is allowed if it does not agree with her position. One only has to look at the scale of democracy denying instruments (such as trashing privacy and constructing the West’s biggest surveillance state) she brought to the country in her time at the Home Office. The ‘Meaningful Vote’ was cancelled – but only because she was facing democratic defeat. A second vote was then forced upon May – a confidence vote leaving her badly wounded. But no second referendum is allowed. As far as the PM is concerned only she has the right to interpret the view of the country. Let’s not forget May pretty much lost a general election campaign in which she demanded a personal mandate. May disappears into secretive meetings precisely because she can’t communicate with anyone at all – not the electorate, or the Tory party or that of parliament. In the meantime, the government have just been accused of wasting £100,000 on a social media campaign to get support for her Brexit deal at the vote she just cancelled. It is not that May is in a difficult position – it’s that she is clueless as are her woeful advisors. All these reports, investigations and scandals that have emerged since Britain’s EU referendum must surely lead everyone to conclude that the EU referendum result was, in fact, more the outcome of a paid-for propaganda exercise facilitated by ultra right-wing radicals in the Tory party than democracy in action. It is leading Britain into chaos. Democracy was denied to Britain when we found out that foreign-born billionaires and corporations had massively overspent official campaigning budgets set in law. Democracy was denied when Theresa May came to power and it will continue to be denied as she constantly changes the goalposts to best suit her game. There is only one thing we can be sure of. 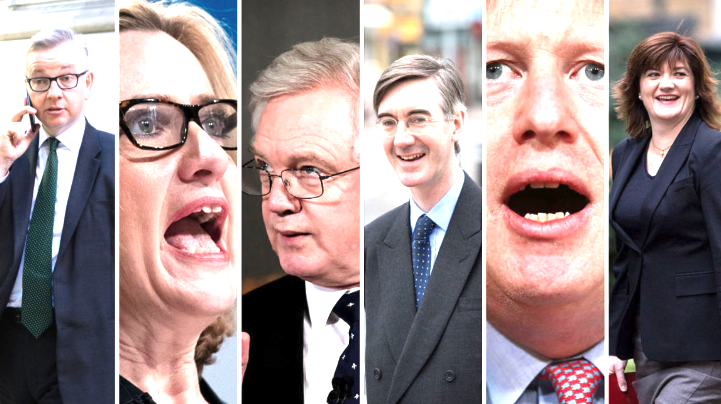 The ‘investors,‘ especially the vulture funds, hedge funds and special interest groups exposed by all these scandals are looking to profit from the very chaos that Brexit causes – and it is unbelievable how been successful that plan has turned out to be! Graham Vanbergen is the contributing editor of TruePublica, a columnist at the European Financial Review and author of Brexit – A corporate coup d’etat.